NASA has joined Tumblr, launching four new profiles August 7. A constellation of new NASA profile pages have gone live on Tumblr — including profiles for astronaut Peggy Whitson, the Juno mission to Jupiter and the Curiosity rover on Mars. NASA posted its first message to the new Tumblr page Aug. 7, adding that platform to its large collection of social media accounts on Facebook, YouTube, Twitter and Instagram. And echoing its Twitter strategy, where a separate account can be found for nearly every individual mission, department and group of interest (around 140 at last count, not including individual astronauts), NASA is getting specific: opening up not just one but five diverse Tumblr accounts to start. Scrolling down a Tumblr profile, visitors see images, videos and short blog posts in a long, reverse-chronological stream. Similar to Twitter, Tumblr users can follow different profiles, whose posts will then be incorporated into their own dashboard to read. 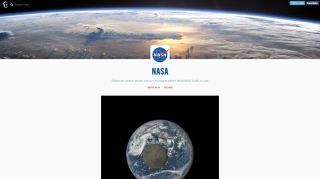 NASA's first post promises "a regular dose of space," chock-full of information, images and videos on NASA's exploration and discoveries. Its later posts call out the other NASA profiles and re-post their photos and text. The first of those other pages is run by astronaut Whitson and will offer "a behind-the-scenes look at an astronaut's journey as she trains for a six-month mission to the International Space Station," NASA officials said in a statement. NASA JunoCam, another new profile, will showcase images from the Juno mission en route to Jupiter alongside amateur astronomers' photos. A profile for the Curiosity Mars rover has already begun posting videos, infographics and views from the Martian surface. Whitson, the Juno mission and the Curiosity rover are no strangers to social media: they each have Facebook and Twitter profiles (plus YouTube, for Juno), and Curiosity even "checked in" to Mars on the location-based application Foursquare.